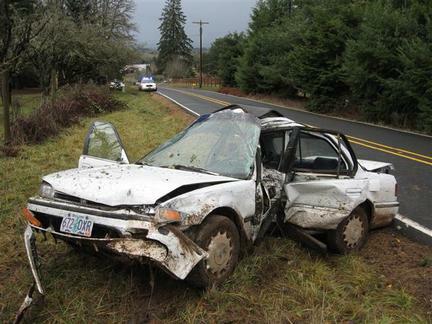 A Portland man and woman were seriously injured this morning after the car they were in crashed into a tree on N. W. Mason Hill Road east of N.W. Jackson School Road near the Helvetia community, the Washington County Sheriff's Office reported. A Honda Accord driven by Richelle Peterson, 31, was apparently speeding when it crossed the centerline, left a straight stretch of the roadway and slid sideways with the driver's door crashing into a tree at about 8 a.m., police said. Peterson was taken by ambulance to Legacy Emanuel Hospital in Portland where she is listed in critical condition. Passenger Craig Robinson, 40, was also taken to the hospital and was listed in serious condition. The Washington County Crash Analysis Reconstruction Team is investigating the accident. It appears speed and alcohol were factors contributing to the crash, police said.